What is the difference between thalassemia minor and major? What is the genetic pattern of inheritance of beta thalassemia? Thalassemias are inherited blood disorders. Thalassemia patients make defective hemoglobin. There are two forms of beta thalassemia: thalassemia minor and thalassemia major (also called Cooley's anemia). Beta thalassemia is classically described in people of Italian and Greek origin. The thalassemias are a group of genetic (inherited) blood disorders that share in common one feature, the defective production of hemoglobin, the protein that enables red blood cells to carry and deliver oxygen. There are many different mechanisms of defective hemoglobin synthesis and, hence, many types of thalassemia. The most familiar type of thalassemia is beta thalassemia. It involves decreased production of normal adult hemoglobin (Hb A), the predominant type of hemoglobin from soon after birth until death. (All hemoglobin consists of two parts: heme and globin). The globin part of Hb A has 4 protein sections called polypeptide chains. Two of these chains are identical and are designated the alpha chains. The other two chains are also identical to one another but differ from the alpha chains and are termed the beta chains. In persons with beta thalassemia, there is reduced or absent production of beta globin chains. There are two forms of beta thalassemia. They are thalassemia minor and thalassemia major (which is also called Cooley's anemia). Thalassemia minor: The individual with thalassemia minor has only one copy of the beta thalassemia gene (together with one perfectly normal beta-chain gene). The person is said to be heterozygous for beta thalassemia. Persons with thalassemia minor have (at most) mild anemia (slight lowering of the hemoglobin level in the blood). This situation can very closely resemble that with mild iron-deficiency anemia. However, persons with thalassemia minor have a normal blood iron level (unless they are iron deficient for other reasons). No treatment is necessary for thalassemia minor. In particular, iron is neither necessary nor advised. Thalassemia major (Cooley's anemia): The child born with thalassemia major has two genes for beta thalassemia and no normal beta-chain gene. The child is homozygous for beta thalassemia. This causes a striking deficiency in beta chain production and in the production of Hb A. Thalassemia major is a significant illness. The clinical picture associated with thalassemia major was first described in 1925 by the American pediatrician Thomas Cooley. Hence, the name Cooley's anemia in his honor. At birth the baby with thalassemia major seems entirely normal. This is because the predominant hemoglobin at birth is still fetal hemoglobin (HbF). HbF has two alpha chains (like Hb A) and two gamma chains (unlike Hb A). It has no beta chains so the baby is protected at birth from the effects of thalassemia major. Anemia begins to develop within the first months after birth. It becomes progressively more and more severe. The infant fails to thrive (to grow normally) and often has problems feeding (due to easy fatigue from lack of oxygen due to the profound anemia), bouts of fever, diarrhea, and other intestinal problems. The gene for beta thalassemia is not evenly distributed among peoples. It is, for example, relatively more frequent in people of Italian and Greek origin, both of which are peoples from the Mediterranean. Because of this, thalassemia major has been called Mediterranean anemia. The name thalassemia was coined at the University of Rochester in upstate New York by the Nobel Prize-winning pathologist George Whipple and the professor of pediatrics William Bradford from the Greek thalassa for sea and -emia, meaning the blood. Thalassemia means "sea in the blood." But for the Greeks, the sea was the Mediterranean, so thalassemia also conveys the idea of the Mediterranean in the blood. The reason that the gene for beta thalassemia is relatively common, for example, among people of Italian and Greek origin is that parts of Italy and Greece were once full of malaria. The presence of thalassemia minor (like sickle cell trait in Africa) afforded protection against malaria, and therefore, this gene thrived. The pattern of genetic transmission of beta thalassemia (and sickle cell disease) was deciphered by James V. Neel when he was at the University of Rochester (and later at the University of Michigan). Dr. Neel recognized that the parents of children with thalassemia major had thalassemia minor with one beta thalassemia gene. When these parents had children, they have a 25% chance of having a thalassemia major child (with both genes for beta thalassemia), a 50% chance of having children with thalassemia minor (with only one gene for beta thalassemia), and a 25% chance of having a child without thalassemia major or minor (with both genes for normal beta chains). This form of inheritance is medically referred to as an autosomal recessive pattern. Persons with thalassemias have smaller sized red blood cells than unaffected people as well as low red blood cell counts (anemia). Thalassemia major and thalassemia minor can now be diagnosed (and distinguished from one another) not only by conventional clinical and blood testing, but also by molecular and genetic tests. These tests permit accurate diagnosis to be made at any time, even before birth (in fact, well before the beta chains are even synthesized). Infants with thalassemia major are well at birth because of a special form of hemoglobin present in the fetus and newborn. Eventually, however, this hemoglobin is replaced by defective hemoglobin. Symptoms emerge late in the first year of life. The child develops pale skin, irritability, growth retardation, swelling of the abdomen due to enlargement of the liver and spleen (hepatosplenomegaly) with jaundice. This is associated with severe anemia with rupture of the red blood cells (hemolytic anemia). The child with thalassemia major becomes dependent on blood transfusions and, although they do help, they create further problems including iron overload. Folic acid supplementation is often given. At this time, the primary treatments are directed at relieving symptoms of the illness. Selected patients may qualify for bone marrow or stem cell transplants. Gene therapy remains a potential treatment for the future. The long-term hope is that thalassemia major will be cured by insertion of the normal beta-chain gene through gene therapy or by another modality of molecular medicine. Alpha thalassemia is a disorder in which the alpha globin protein is underproduced. 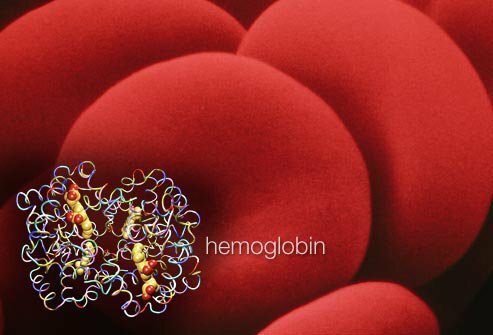 There are two pairs of genes that carry the code for the alpha chains of hemoglobin. When one gene is impaired, that person is in a carrier state and suffers no medical problems. When four genes are impaired, the production of fetal and adult hemoglobin is prevented, resulting in hydrops fetalis and leading to death before birth. Hereditary hemochromatosis (iron overload) is an inherited disorder in which there is excessive accumulation of iron in the body. Individuals may have no symptoms or signs, or they can have severe symptoms and signs of iron overload. The most effective treatment for hemochromatosis is therapeutic phlebotomy.